Home Economy Is Paying Taxes Patriotic? The context of Secretary Lew’s letter is important, however. Dozens of American companies have made acquisitions or merged with other companies based in the United Kingdom, or more advantageously, Ireland, in order to circumvent the U.S. confiscatory 35% corporate tax rate, which is currently the highest in the world. By basing operations in Ireland, these newly migrated companies pay a relatively paltry flat 12.5% tax on profits. Nine of the top ten global pharmaceutical companies now have operations in Ireland, and some of the largest technology companies, including Google, Twitter, and Facebook, do as well. 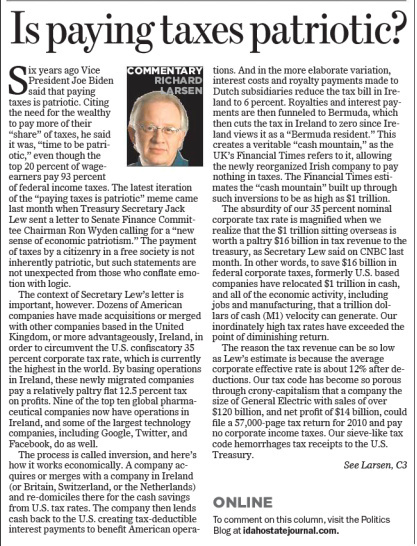 The absurdity of our 35% nominal corporate tax rate is magnified when we realize that the $1 trillion sitting overseas is worth a paltry $16 billion in tax revenue to the treasury, as Secretary Lew said on CNBC last month. In other words, to save $16 billion in federal corporate taxes, formerly U.S. based companies have relocated $1 trillion in cash, and all of the economic activity, including jobs and manufacturing, that a trillion dollars of cash (M1) velocity can generate. Our inordinately high tax rates have exceeded the point of diminishing return. 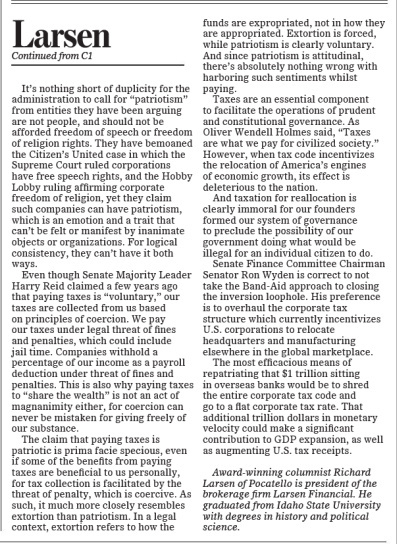 The claim that paying taxes is patriotic is prima facie specious, even if some of the benefits from paying taxes are beneficial to us personally, for tax collection is facilitated by the threat of penalty, which is coercive. As such, it much more closely resembles extortion than patriotism. In a legal context, extortion refers to how the funds are expropriated, not in how they are appropriated. 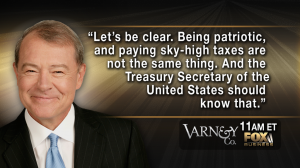 Extortion is forced, while patriotism is clearly voluntary. And since patriotism is attitudinal, there’s absolutely nothing wrong with harboring such sentiments whilst paying. 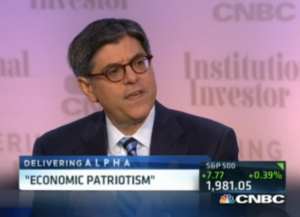 One Response to Is Paying Taxes Patriotic? 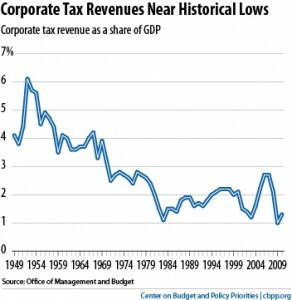 Pingback: TrishAndHalli.com » Blog Archive » Richard Larsen: Is Paying Taxes Patriotic?